Anand, Mulk. (1940). Untouchable. Penguin UK. The plot of this book revolves around the argument for eradicating the caste system. It depicts a day in the life of Bakha, a young “sweeper”, who is “untouchable” due to his work cleaning latrines. Calvino, Italo. (1978). Invisible cities. Houghton Mifflin Harcourt. The novel can be loosely described as an exploration—sometimes playful, sometimes melancholy—of the powers of the imagination and of the fate of human culture. Waste infrastructure, and the role of filth, cleanliness, and sacrifice are part of what make some of the imagined cities possible. DeLillo, Don. (1999). Underworld. Pan Macmillan. A central character is Nick Shay, a waste management executive, who leads an undirected existence in late 20th century America. The waste and byproducts of history, dissected and discussed throughout the novel, constantly resurface from the underworld (or, subconscious) of the American population despite their best attempts to repress and bury things they would rather forget. Dickens, Charles. (1865). Our mutual friend. TB Peterson & brothers. Having made his fortune from London’s rubbish, a rich misanthropic miser dies and his fortune goes to his estranged son.Before the son can claim his inheritance, he goes missing, presumed drowned. A body is found in the Thames by Gaffer Hexam, a waterman who makes his living by retrieving corpses and robbing them of valuables before rendering them to the authorities. The filthy Thames is a main character in the novel, taking away and granting life and redemption according to moral orders. 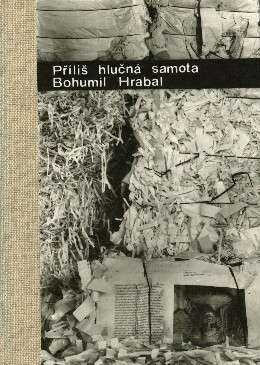 Hrabal, Bohumil. (1992). Too loud a solitude. Houghton Mifflin Harcourt. “For thirty-five years now I’ve been in wastepaper, and it’s my love story.” It tells the story of an eclectic and dimwitted old man who works as a paper crusher in Prague, using his job to save and amass astounding numbers of rare and banned books, he is an obsessive collector of knowledge. Marten, E. (2013). Waste. Open Road Media. A spare and chilling account of the day-to-day experience of Sloper, a janitor in a big-city office building, WASTE explores the import of the discarded–for those who generate it, those who dispose of it, and those who are themselves discarded. From the humble prospect of his station, Sloper uncovers ominous possibility in lives he barely brushes. Miéville, China. (2003). Perdido street station. Random House Publishing Group. Powers, Richard. (2010). Gain: A Novel. Macmillan. It intertwines two stories: the first is the history of Clare International, a chemical conglomerate with origins in soap manufacturing in the early 18th century; the second is of Laura Bodey, a 42-year-old divorcée living near Clare International’s headquarters who develops ovarian cancer. Tekin, L., & Kristin, B. (1993). Tales from the Garbage Hills. London, New York: Marion Boyars. The cast-offs of modern urban society are driven out onto the edges of the city and left to make a life there for themselves. They are not, however, in any natural wilderness, but in a world of refuse and useless junk – a place which denies any form of sustainable life. Here, the unemployed, the homeless, the old and the bereft struggle to build shelters out of old tin cans, scavenge for food and fight against insuperable odds. There is the mysterious great wind that flattens their homes every night and cripples their children; the industrial pollution from the factory which slowly disfigures them. Wallace, David Foster. (2011). Infinite jest. Hachette UK. In the novel’s future world, the United States, Canada, and Mexico together compose a unified North American superstate known as the Organization of North American Nations, or O.N.A.N. On the orders of U.S. President Johnny Gentle (who had campaigned on the platform of cleaning up the USA while ensuring that no American would be caused any discomfort in the process), much of what used to be the northeastern United States and southeastern Canada has become a hazardous waste dump, an area known as the “Great Concavity” by Americans and the “Great Convexity” by Canadians. Vance, Jack. (1978). “Rumfuddle” in The Best of Jack Vance. Taplinger Publishing Company. The main character rules earth via time travel, giving everyone their own version of a pristine, wild Earth. To achieve this, people have to clean up the original Earth during the week, which involves dumping everything that is not wilderness into an alternative Earth’s ocean via a space-time portal. Zadoorian, Micheal. (2000). Second Hand: A Novel. WW Norton. Richard searches for the odd and obsolete — and sells it at his second-hand shop on the edge of Detroit. Michael Zadoorian has written an unforgettable novel about knick-knacks, garage sales, romance, and the bonds we form with people and things — the perfect story for anyone who has ever loved something second hand.